Tech Mesh was my second developer conference this year, the first being QCon. While QCon had a track devoted to functional programming, Tech Mesh was devoted to 'alternative programming', meaning FP, in its entirety, with keynotes on Haskell, Clojure, and Erlang, and other talks covering Scala and F#. A highlight for me was meeting Rich Hickey. I am impressed that in five years he has taken Clojure to the same place it has taken Haskell twenty years to reach. Another highlight was seeing Joe Armstrong, Robert Virding, and Mike Williams deliver a joint keynote. Slides for the Haskell keynote (Peyton Jones, Hughes, and Wadler) are here, and for my other talk are here. Another pleasure was meeting Clojure developer Bodil Stokke, who was wearing a shirt reading `A monad is just a monoid in the category of endofunctors. What's the problem?' I'm grateful to Pelotom for an answer on StackOverflow with a definitive explanation of this statement and its spurious connection to myself. 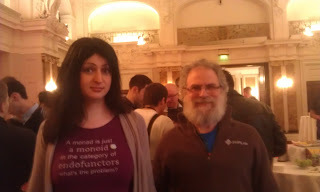 one of the highlights of last year for me, was meeting you personally at the QCon. It was a big inspiration to understand your ideas, and get in touch with your intellect from such a close distance. Thank you in bunches for your great contributions! I've forwarded Nicholas' request to the Tech Mesh organisers.